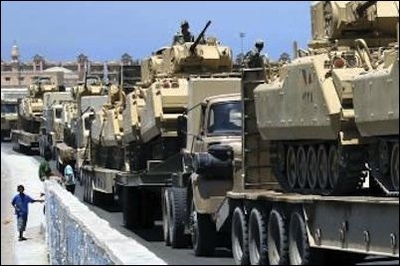 Despite having signed a peace treaty with Israel, Egypt's armed forces continue to receive thousands of tanks and hundreds of planes from Washington. "There's no conceivable scenario in which they'd need all those tanks short of an alien invasion," declares Shana Marshall of George Washington University. Egyptian officers, including President Abdel Fattah al-Sisi, attend courses at U.S. institutions such as the Army War College in Carlisle, Pennsylvania. 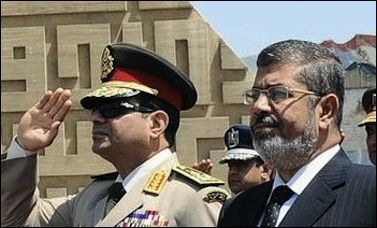 Gen. Abdel Fattah al-Sisi (left) standing next to the man he overthrew, Muslim Brotherhood leader and Egyptian president Mohamed Morsi. The popularly supported coup poses a contorted foreign policy conundrum for Washington, which has been trying to figure out whether or not to continue military support to Cairo, and if so, what kind. Since 1986, Washington has transferred 221 F-16 fighter jets with a total value of $8 billion to Egypt as part of its military aid package despite the fact that U.S. military advisors have been saying for years that Cairo had more than enough planes and tanks and does not need any more. Likewise, over a thousand Abrams tanks have been transferred to Egypt since 1992 at a total cost of $3.9 billion though close to 200 of them are in mothballs and have never been used. Such an arrangement can have economic benefits within Egypt as well: The Abu Zaabal tank repair factory (aka Factory 200) in Helwan is the site of a joint production of Abrams tanks that employs thousands of local workers. American defense contractors make millions annually and employ tens of thousands of workers as a direct result of military aid to Egypt and other countries in the Middle East. 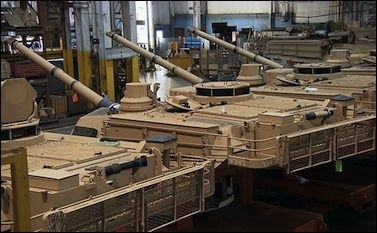 These Abrams tanks are assembled at a General Dynamics plant in Lima, Ohio. The question of the continuation of military assistance came up a second time after the ouster of President Morsi in July 2013 in what was, for all intents and purposes, a military coup, albeit one with massive popular backing. American aversion to such nondemocratic changes of government was reflected in a law that, with a few exceptions, prohibited economic aid "to the government of any country whose duly elected head of government is deposed by military coup or decree." Though the Obama administration initially refrained from describing Morsi's removal in these terms, the military's meddling in Egyptian politics was not the only thing that irked Washington; there was also the fact that the armed forces embarked on a violent campaign to suppress the Muslim Brotherhood. In late July, the scheduled delivery of four F-16s to Egypt was frozen. Then on August 15, Obama cancelled the joint U.S.-Egyptian exercises scheduled for September and, along with senior administration officials, condemned the violent dispersal of Muslim Brotherhood supporters from outdoor rallies the previous day. Sisi: "You [the United States] turned your back on the Egyptians, and they won't forget that." 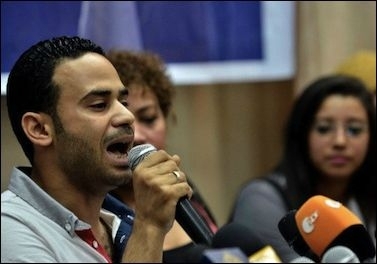 Mahmud Badr (above), a Tamarod co-founder, minced no words when he attacked Obama for condemning the June 30 revolution, declaring in no uncertain terms that Egypt no longer needed U.S. aid: "I tell you, President Obama, why don't you and your small, meaningless aid go to hell?" The Obama administration seriously miscalculated how its statements and actions would be perceived by both the Egyptian public and its leadership. Washington has sent a message both to its Middle Eastern enemies and allies that its word and "friendship" were highly iffy. Following Mohamed Morsi's overthrow, relations between Moscow and Cairo have grown closer. 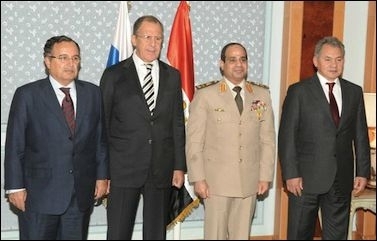 On November 13, 2013, for the first time since Egypt changed its orientation from East to West in the mid-1970s, a Russian foreign minister, Sergei Lavrov (second from left), and a defense minister, Sergei Shoygu (right), visited Egypt. Then-Egyptian minister of defense Abdel Fatah al-Sisi (second from right) and foreign minister Nabil Fahmy (left) met with their Russian counterparts. The third and final outcome of either the threat or an actual reduction in U.S. aid is the growing role of other states, above all Russia, in the affairs of the Middle East. The United States under Obama is perceived as a weakened power on a slow retrenchment from the region. As nature—and seemingly geopolitics—abhors a vacuum, U.S. diffidence is encouraging rival powers to play a greater role in Egypt and one that bodes no good for the long term. American history can be instructive here. During the 1950s, the Eisenhower administration tried to exploit U.S. military, technical, and economic assistance to persuade Gamal Abdel Nasser's Egypt to join an alliance to defend the region from communism. When courting Cairo failed, Washington refused to provide the Egyptians with requested weapons and later withdrew its offer to fund the construction of the Aswan high dam. The strategy was a failure as Moscow quickly provided arms to Cairo through Czechoslovakia. Nasser was initially unwilling to chain himself to any major power, instead maneuvering adroitly between Washington and Moscow. In a long and patient process that developed over subsequent years, Soviet ties turned into dependence—one that increased markedly in the aftermath of the 1967 war. Two factors were largely responsible for this. For one thing, the Soviets never set conditions for assistance to an Arab country. For another, "the absence of any statement that the Middle East was vital to American interests" was seen as a green light by Russia to become fully involved. Under a contract to be funded by Saudi Arabia and the United Arab Emirates, Russia will supply the Egyptian military with a variety of weapons. Yehuda Blanga is a lecturer in the department of Middle Eastern studies at Bar Ilan University and a visiting scholar at The Moshe Dayan Center, Tel Aviv University. Mark Thompson, "Strong and Silent," Time Magazine, Feb. 14, 2011; "Military Balance Files: Egypt," The Institute for National Security Studies, Tel Aviv, accessed June 6, 2014. Robert Gibbs, press secretary, White House, Washington, D.C., Jan. 28, 2011; The Guardian (London), Jan. 29, 2011. "Soviet Penetration of the Middle East," May 12, 1970, Israel State Archives (hereafter ISA), Foreign Ministry (hereafter FM), 4605/2; William J. Burns, Economic Aid and American Policy toward Egypt, 1955-1981 (Albany: State University of New York Press, 1985), p. 16; Ofer Mazar, Betsilo Shel HaSphinx (Tel Aviv: Ministry of Defense, 2002), pp. 15–28. Ibid. ; al-Ahram, Nov. 19, 2013; Daily News Egypt (Cairo), Nov. 20, 2013; RIA Novosti (Moscow), Feb. 14, 2014. Related Topics: Egypt, US policy | Fall 2014 MEQ receive the latest by email: subscribe to the free mef mailing list This text may be reposted or forwarded so long as it is presented as an integral whole with complete and accurate information provided about its author, date, place of publication, and original URL.